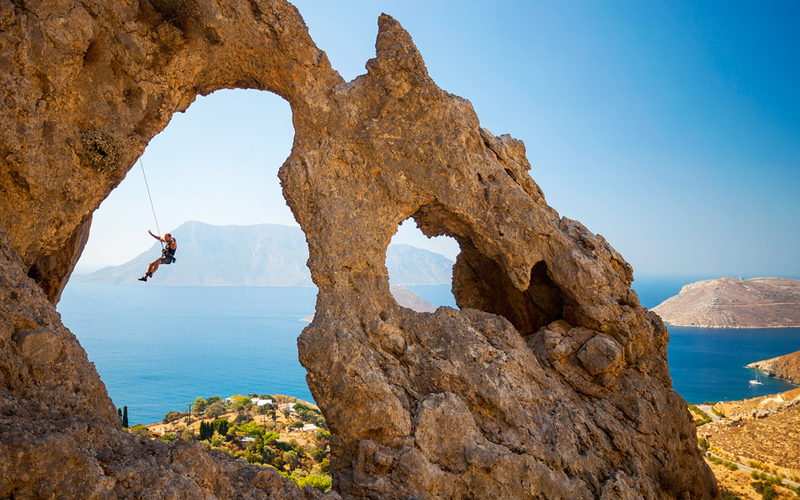 When it comes to rock climbing, Greece is unique. Thanks to the temperate climate, you can be actively involved year-round in the sport. More importantly, the rugged landscape of the land offers a variety of options (examples are limestone, caves, and marble), and so many curious geological formations to explore on all fours. But with so many options, where should one start? Our expert guide, Aris Theodoropoulos, gave us his top picks for sport climbing in Greece, suitable for all: from the first-timer nervously placing a hesitant foot on a rock face, all the way up to the advanced athlete who clambers off without a backward glance. There could be no better person to ask about the rising popularity of Greece in the rock climbing world other than the man who literally wrote the guidebook on the topic. Aris is an avid climber and mountaineer, beginning at the age of 16, and he is considered the godfather of sport climbing in Greece. He divides his time between Kalymnos and Athens. The average Greek knows Kalymnos as a sleepy destination where you might chill out in tavernas and buy a couple of sea sponges; but it’s a mecca for sport climbers. 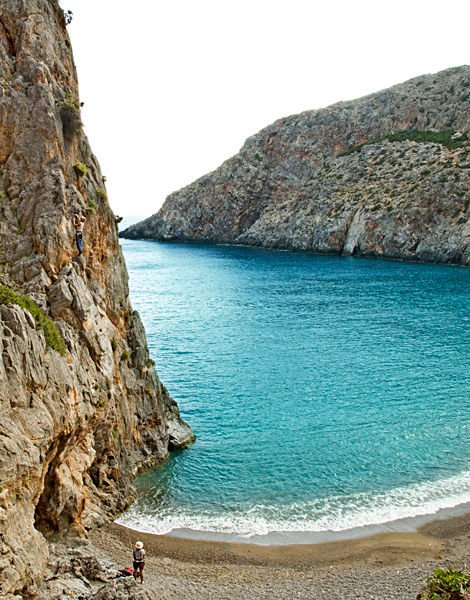 According to Aris, rock climbing as a sport isn’t such a new phenomenon in Greece – it’s been around since the 1940s. “The sport grew in the 80s and 90s, and really took off after the year 2000” he says. 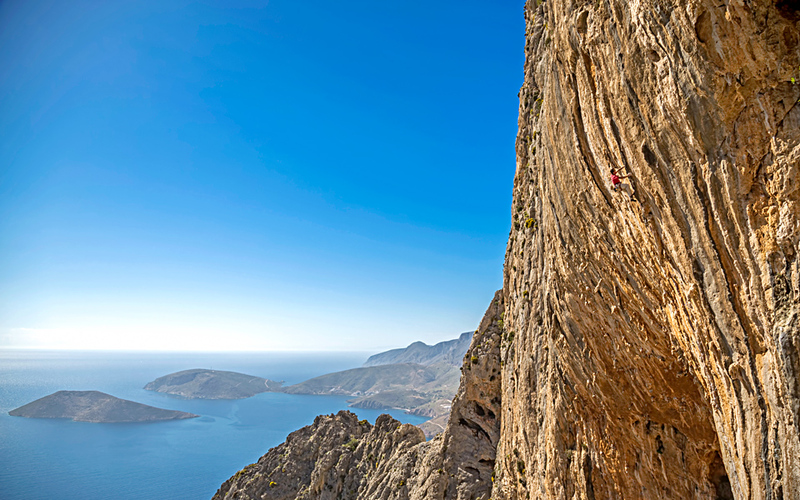 Any list about sport climbing in Greece would naturally have to begin with Kalymnos – the island which Aris says is currently considered one of the best climbing destinations in the world. Just before 2000, Italian climbers visiting the island realized the richness of its rock formations, and laid down the first routes. Aris learnt about this and soon followed. After himself discerning the island’s potential, he began developing sport climbing in Kalymnos in a holistic way, in cooperation with the local municipality as well as with foreign and local climbers; he especially focused on matters of safety and infrastructure. Word spread, and now climbers come from all over the world to explore the island’s routes. “We get about 10,000 sport climbers here every year; maybe more,” says Aris. “Kalymnos is one of the best organized climbing locations, probably in the world, which is why it’s very safe. It offers you the full package: outstanding nature on a beautiful Aegean island – you can see the sea and the beautiful blue from almost anywhere you climb – it has very good infrastructure, to stay, to eat, etc. after climbing. It’s a perfect paradise for climbers. And if you still want to know why, just look at the pictures!”, he adds with a smile. The enormous, imposing boulders of Meteora in central Greece attract all kinds of tourists, and sport climbers are no exception. Where else can you crawl on a UNESCO World Heritage site? The setting is otherworldly, and the rock –an unusual mixture of sandstone and conglomerate – is a challenge that experienced climbers find hard to resist. The six rock pillars on which the monasteries rest are off limits, but there are more than 100 others to climb. “There is excellent climbing potential all over the island, but the best place is Agiofarago, a canyon which leads down to the sea in southern Crete, surrounded by very rich nature,” says Aris. This gorge has routes that are suitable for beginners right through to the most advanced. The best part is that is ends at the mouth of a beautiful secluded bay with fine sand and azure waters. What better reward could there be after all that exercise? 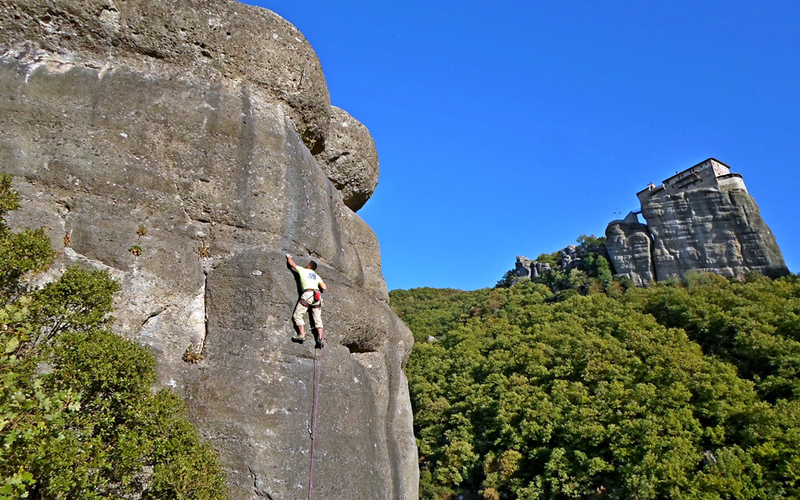 “Athens might well be the only capital in the world which has so many good sport climbing routes – of such high quality – just half an hour away from the city center, like, for example, in Parnitha, Penteli and Hymmetus mountains,” Aris tells us. 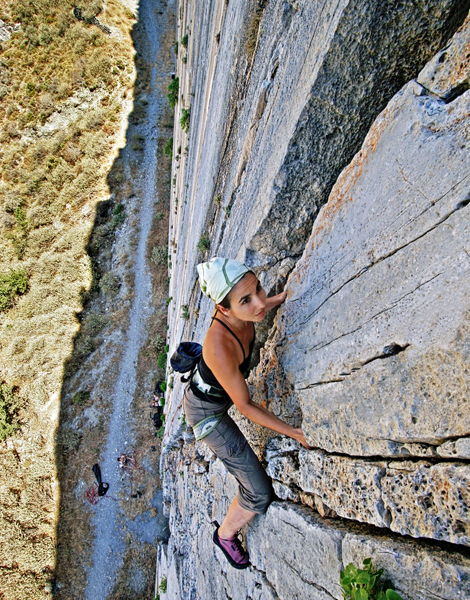 There are around 2,000 sport climbing routes in Athens. All three locations he mentions offer a different climbing experience: Parnitha is known for its beautiful and varied natural surroundings, while most of the climbing in Penteli takes place in well-climbed and safe abandoned marble quarries; Hymmetus offers a variety of levels, as well as diverse flora and fauna. After that, the hike to the Acropolis will feel like a piece of cake. 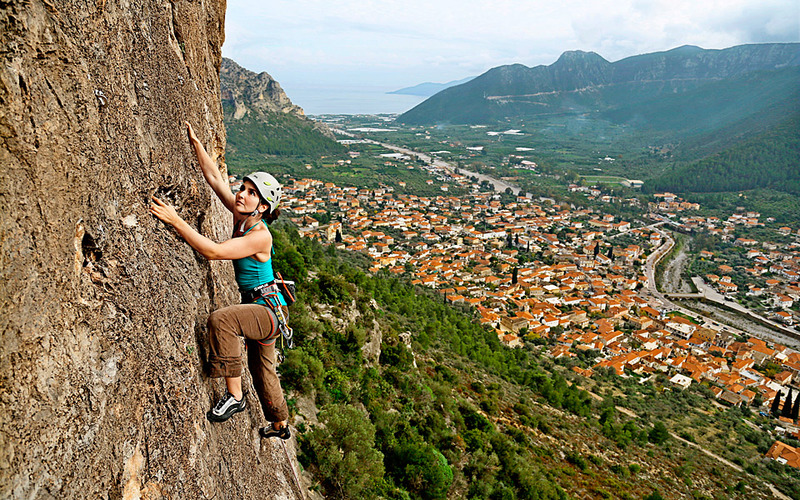 The epicenter for sports climbing in the Peloponnese is the town of Leonidio, which boasts around 1,000 different routes. “There are very few areas in Europe suitable for the sport in the winter, from November to March, so this is one big advantage for Leonidio” says Aris. The quaint little town that’s gaining recognition lies at the foot of Mt Parnon; towering in the town’s background is a cliff, 250 meters high, of red limestone. The cliff is concave, which means it naturally protects you from the winter elements. Located in Western Greece, this huge limestone cliff sits opposite the city of Patra. It is 900 meters tall, and drops steeply into the sea. It’s a beautiful place, with a lot of potential to also become one of the best places for climbing in Greece and the world,” says Aris. There are around 200 routes to choose from, with a mix of levels. Varasova is surrounded by the sea, and is a good option for autumn climbing, when it is relatively peaceful, and a great option if you like having the rocks to yourself. Refresh yourself by a dip in the sea after a day’s adventure. A beginner’s guide to a favorite holiday tradition.